If you love the aromatic, rich flavour of freshly ground, freshly brewed coffee, you’ll love the Chester Grind and Brew Coffee Maker from Russell Hobbs. The freshness of bean-to-cup coffee in a machine that is really easy-to-use. Simply pop the beans in the grinding mill, choose your strength and the number of cups you want, hit the button and go. You’ll enjoy delicious coffee in just a few moments. Freshly ground coffee is perfect as a morning ‘wake-me-up’, a mid-afternoon ‘pick-me-up’, or to serve after dinner. The Chester Grind and Brew’s digital 24-hour programme feature enables you to set what time of day your coffee brews so it can be ready when you wake up or you can enjoy a perfectly-timed hot drink later in the day. The Chester Grind and Brew’s warming plate also keeps your coffee warm and fresh for up to 40 minutes so one pot lasts longer. It also has a permanent filter so you don’t have to use disposable paper filters every time. This sits in a removable holder so it’s easy to take out for emptying and cleaning. 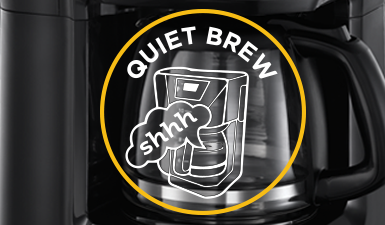 60% quieter*, handy for when you want to make fresh coffee when everyone else is asleep or if you simply prefer a quieter appliance.